Noam Chomsky has been called the father of modern linguistics, the world’s top public intellectual, and more recently received more nominations for the “wisest mind of our time” than the Dalai Lama. Michel Gondry’s Is The Man Who Is Tall Happy is a mesmerizing conversation between the two men, using creative and oftentimes hilarious animations to firstly make their conversation more accessible than a lecture, and secondly to make the 88 minutes an interactive experience. This second point is most present in Gondry’s occasional interruptions to clarify and to reflect on Chomsky’s words, like a refractory period for comic relief, and to ensure the audience isn’t falling behind in the conversation. Structurally the film is reminiscent of John Carpenter’s Academy Award-winning animated short The Moon and the Son. In the imagined conversation between a son and his deceased father, the audience feels like the son, a young curious mind asking simple questions to his wise father. Similar sentiments are present in Gondry’s film: the joy lies in watching that wise man’s thoughts unfold. Visually, the animations seamlessly morph into one another like in the works of pseudonymous Italian artist “Blu”. Like in Blu’s 7-minute video MUTO, Man Who Is Tall abandons any obsession with perfection, instead channeling its energy into innovative and surreal imagery. Shot primarily on 16mm film, the animations and footage of the actual conversation are warm and inviting. The director of modern classics like Eternal Sunshine of the Spotless Mind and The Science of Sleep maintains his humble post as conversation-curator, keeping his own quirkiness to a minimum. Gondry self-deprecates as his French accent sometimes impedes the conversation, becoming a prime opportunity for comedy. It is the little things that make the film so endearing. The words “Ha Ha Ha” are animated as the men laugh. 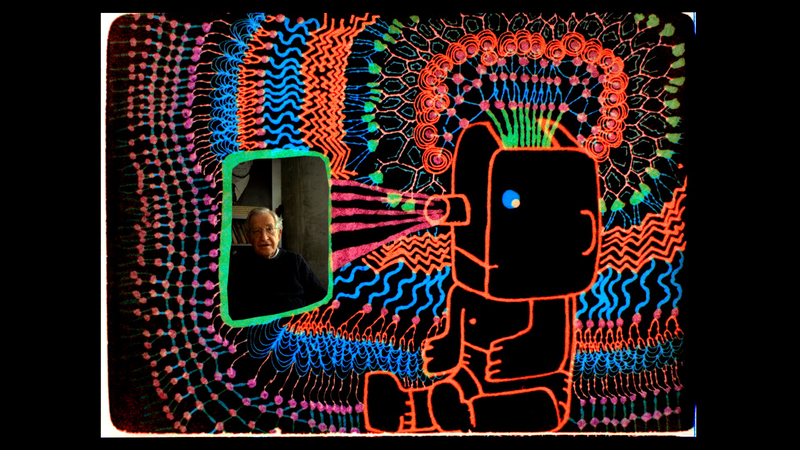 The two sitting men are recreated as drawings, and Gondry animates a frown on his face when Chomsky misinterprets his question. The animation reflects the exchanges. Gondry thinks Chomsky says “eel” when really he said “yield”, and the thoughts rising from an animated man’s head transform into eels which then penetrate soil and grow into plants, in accordance with their conversation on agriculture and latent farming knowledge. It is worth noting that the film is all dialogue, save for a touching scene when Chomsky refuses to talk in detail about his late wife. Gondry takes a moment to animate what he imagines their relationship was like. If you require more dramatic stimulus than dialogue and parallel animation, beware. That being said, the content of the conversation is intensely fascinating. Chomsky has a way of deconstructing theories and phenomena until they are digestible and engaging. He begins with the advent of modern science, integrating ideas from Galileo, Newton, and Hume to answer Gondry’s simple but effective questions. Known primarily for his work in linguistics, Chomsky inevitably gets around to talking about the idea versus the word, telling a fairy tale of a donkey being turned into a rock and back into a donkey. He marvels at how children understand that the donkey never really stopped being a donkey, advising Gondry to throw his ideas about language acquisition out the window. The moment I found most evocative was Chomsky’s exploration of “abstract continuity”, with the “Ship of Theseus” as an example. For those unfamiliar with the paradox (as I was), the story revolves around Theseus’ ship falling apart with planks dropping into the sea. Theseus and his crew repair the ship as it falls apart, fishing wood out of the water to replace the fallen planks. The fallen planks wash up on an island, where a man reconstructs Theseus’ ship piece by piece, and eventually, Theseus’ ship is made of all new planks, while the man on the island has reconstructed Theseus’ ship with all the original pieces. At this point, which is the Ship of Theseus? With many well-explained thought experiments like this one, the film is an intellectual treat with emotional moments scattered throughout. It is especially gratifying when the men begin talking about the film’s namesake. Chomsky reconstructs the sentence “Is The Man Who Is Tall Happy”, moving the “is” from one spot to another. He asks Gondry why moving the first “is” is different than the second “is”, explaining linear versus structural ideas in linguistics. The film is modest and self-conscious, generously inviting the viewer to listen in on the ideas of an inspiring modern figure. Frankly, I was a little too engrossed in the conversation to critically search for its flaws. I sometimes imagined myself sitting in a coffee shop, eavesdropping on a student having a great talk with an esteemed professor. Perhaps one could get nauseous from all the motion in the drawings. The visual style is initially a little jarring and unfamiliar, but a few minutes in and it becomes clear that no other format would have produced the same results. “Is The Man Who Is Tall Happy?” is currently screening at IFC. Written by: Sebastian Choe on December 9, 2013. Last revised by: Double Exposure, our reviewer, on January 17, 2014.